Every year Read 20 celebrates the birthday of Theodor Seuss Geisel (March 2, 1904 -September 24, 1991), most widely known for his popular children’s books written and illustrated under the pen name Dr. Seuss. Dr. Seuss was an American writer, poet, and cartoonist. He wrote under the name Dr. Theophrastus Seuss in college and later used Theo LeSieg. 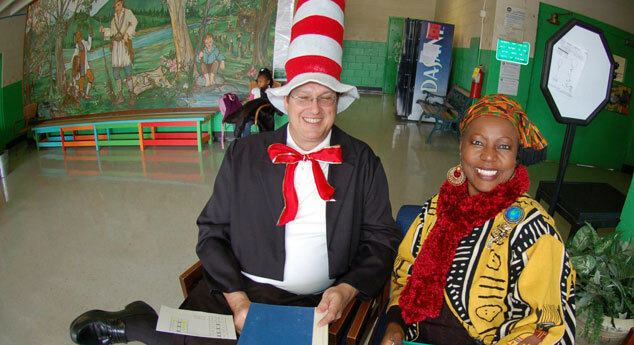 This coming year during RAA Week Read 20 would like to be a part of your Read Across America Celebration. Give us a call at 423.209.6190 early in the year, so that we can place your school or classroom on our RAA calendar. We are looking forward to meeting new friends and sharing the rhythm, rhyme and dearly-loved characters of Dr. Seuss. Watch for the Read 20 staff and (an extra literacy treat!!) the Hamilton County Sheriff, Mr. Jim Hammonds, along with several officers in your school during the last week of February and the first week of March 2019. Send us your comments on the Read 20 FB page. And don’t forget to read every day for at least 20 minutes or more! Look for us in the following schools: Big Ridge Elementary, CSAS, Soddy Elementary, Woodmore Elementary, Grandparent’s Day at Lookout Mtn. Elementary, Clifton Hills Elementary, Bess T. Shepherd Elementary, and Signal Centers, Inc.